(Italy.) With simple cartouches for title, legend, and boundaries. 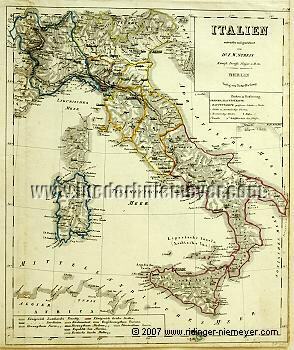 Map of Italy with Corsica, Sardinia, Sicily, Malta, and Algerian coastal strip by Friedrich Wilhelm Streit (Ronneburg, Thuringia, 1772 – Berlin 1839) in steel engraving colored in outline. (1833-37.) 11¾ × 10 in (30 × 25.5 cm). With marks for navigability of rivers, harbours, and channels. – Smoothed vertical fold in the left margin of the image. On the right trimmed slicing the outer borderline. Slightly time-marked.